Light weight. Our Etowah II stove kit with pot stand, outer burner, economizer burner, 3 1/2" x 24" windscreen, and 4 oz fuel bottle is less than half the weight of canister and white gas stoves. Light to pack in. An excellent choice for your bug out bag. Burns quietly. Hear the outdoors you came to enjoy instead of the hiss of white gas or propane. Zero Noise pollution. Inexpensive. Less than a third of the cost of other heavier options. Simple to use. No pumping. No priming. Set the pot stand on top, add fuel and light. Use windscreen if needed. Easy peasy. Many sources for fuel. You can find Denatured Alcohol at any hardware store, Home Depot, Lowes and other stores. Methanol (HEET) is available just about anywhere that sales gasoline or car parts. Fuel consider to be less hazardous to carry than white gas. Etowah manufactures two alcohol stoves. 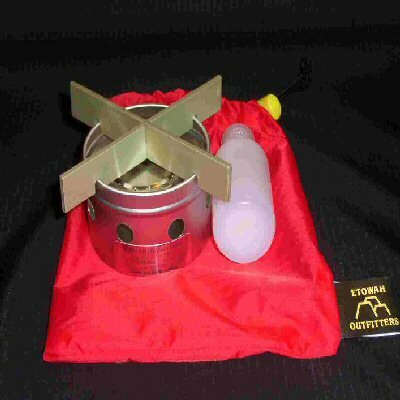 The Etowah II and the EO Solid Fuel Stove with Alcohol Burner. This 5.4 oz alcohol burner kit will hold up to 4 oz of fuel (2 oz will burn up to 40 minutes), and boil 1 quart of water in 7 ½ minutes. 1 pint of alcohol fuel will cook up to 16 meals!!! Includes pot stand/outer burner, economizer burner, new 3 1/2" x 24" windscreen, and 4 oz fuel bottle. For fast boil, use outer burner. For longer boil and simmer, add economizer burner. Kit Weight: 5.4 oz plus fuel. The stove minimalists have been waiting for. Weighs 3.1 oz. 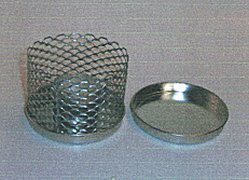 Designed to burn solid fuel tablets or denatured alcohol with a very stable pot stand. Will boil one pint of water in 4 minutes. Comes with stove/pot stand, alcohol burner, windscreen, and storage bag. Weight: 3.1 oz plus fuel. Introducing two sizes of windscreens to meet your stove needs. Made of flexible aluminum for easy adjusting and packing.